White bathrooms can be a beautiful canvas for your ideas. Often people associate white bathrooms with tasteless rooms that remind them of sterile hospital rooms. With a little effort these tasteless rooms can be transformed into a room of elegance. Browse some magazines, look at some design websites or simply look at our list of ideas to transform your dated bathroom to suit your style. This is definitely the most easy and fun way to make a plain white bathroom look wonderful. Add some colourful towels, or a nice basket with rolled up towels, floor mats, long jars, toothbrush holders, nice soap dishes etc. The possibilities are endless and they are easy to switch and change around to give you a different look every few months. Adding a few colourful accessories truly transform your white bathroom. Bring nature right inside your bathroom for a serene and peaceful experience. Add a nice vase of flowers on your counter top to enliven the space and give it some character. 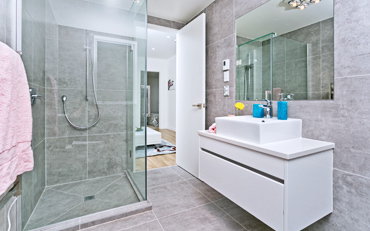 You could also put large and leafy potted plants in the corners to give your bathroom fresh and cleaning environment. Another idea could be to hang plants from the ceiling. Create a focal point in your otherwise white bathroom with a feature wall. You could either have a lot of colourful tiles or beautiful mosaic on one side of the wall to give it a nice Moorish feel. Another idea would be have a wall embedded with pebbles, behind a shower or a bathtub to give it a truly outdoor feel. The way to preserve the integrity of your bathroom is to have everything else in shades of white except the feature wall. Having your entire bathroom in one shade of white can make your bathroom look sterile and cold. But if you add different shades of white to your bathroom, it will make it look elegant and warm. Also add some brass, ivory and metal to your bathroom accessories and fixtures to give it a truly luxurious feel. Having different textured materials in your bathroom will add depth and character to your bathroom. An example would be having a shiny white wood with a marble sink on your vanity. Add a splash of colour by adding some colourful paintings, towels or even replacing parts of the fixtures. An example would be to change the toilet seat to black or red or replacing your faucets and showerheads to nice brassy gold.